One of the biggest challenges in art production for Handmade Hero is in creating the limbless orphans. As those of you who follow the series know, the main protagonists in Handmade Hero have no arms and legs. This is important from both a thematic standpoint and a gameplay standpoint. Although it may not seem like a serious concern for the art side of the project, due to the prejudices of American viewing audiences, lately we've had our hands full developing novel production processes at Molly Rocket that bring our vision of limbless children to life. It is extremely difficult to cast limbless actors. That’s where the problem stems from, really. And this is understandable. Because there are few, if any, limbless parts in mainstream Hollywood, it’s incredibly difficult for aspiring limbless actors and actresses to find footing. This has made for a highly unstable situation where the number of limbless actors in the available pool are sinking rapidly. This meant that if we wanted to hand parts to the best actors and actresses for each role, a decision to hire exclusively limbless performers couldn't stand up to scrutiny. So Anna and I decided the logical next step was to throw caution to the wind and make the leap to a digital-limb-removal-based art pipeline. Although it’s expensive, we felt paying an arm and a leg for high-quality art was what would best support the project going forward, and when you see the results we think you’ll applaud our decision. Rather than keep you at arm's length with regard to our development process, we thought we’d embrace the community and walk you through how a finished orphan asset gets made. The first step in the process is hand-drawn concept art. It can be hard to put one's finger on exactly what makes a great character, but we all know it when we see it. So the first thing we do when creating a new orphan is to fully flesh out the details in sketches. Once we know what a character looks like, we hold auditions to find the right person to portray them. Sometimes we get lucky, and one candidate is head and shoulders above the rest. Other times we can go for hours without a clear winner, and it’s a real nail biter. In those situations, eventually we just have to put our foot down and go with our best guess. The next step is producing a 3D version of the orphan. Once we have the actor picked out, we schedule them for a day in Molly’s motion and performance capture studio. The process is not unlike that used by Weta Digital to bring Frodo Baggins to life in The Lord of the Rings, only our task is much more daunting — they only had to remove a single finger from their character, whereas we have to remove all four limbs. Since each limb (usually) has five digits, this makes our art process roughly twenty times more complex than the special effects for Lord of the Rings! Because of the more drastic nature of the limb removal, we knew we couldn’t lean on traditional CG methods. At first, we were a bit stumped. On the one hand, we thought that actors would move more convincingly if we bound their feet and put them in a straight jacket. On the other hand, such working conditions might be construed as running afoul of union regulations. But although it was a tall order, eventually we were able to get capture sessions to the point where they yielded good data. Sometimes this means letting the sessions run long, as we don’t want to have performances cut off before they are fully realized. Once the capture session is complete, our team of digital limb removalists hop to it and begin carefully cutting and splicing the resulting capture data to remove all traces of the actor’s limbs. This is especially time-consuming for the texture artists, as they must remove the shadows and lighting effects cast by the limbs onto the rest of the body. But eventually, through many hours of intense manual labor, a limbless 3D model and animation set is ready. Finally, the highly detailed 3D models are rotoscoped to produce our signature “hand drawn” look. The process is long and involved, but the results speak for themselves. 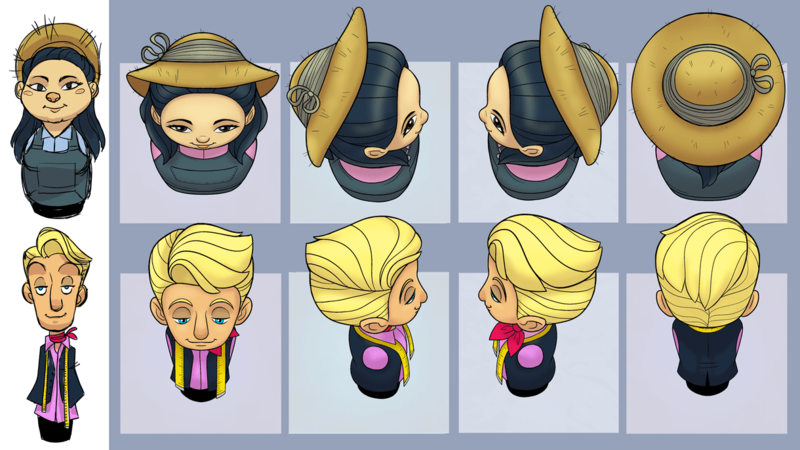 In the header image you can see an example of two different characters’ concept art on the left, and their finished (unlit) sprites on the right. The total time involved from start to finish is about fifty-three-and-a-half man hours, but it’s obviously worth it. This article contains a substantial amount of wordplay. If you'd like to make sure you caught it all, click here to toggle pun highlighting.